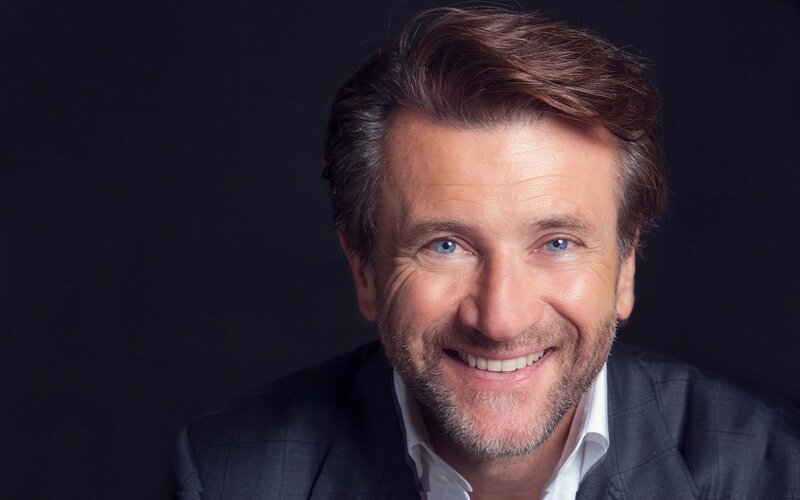 From his birthplace of Varazdin, Croatia, in Eastern Europe to the ballroom of Dancing with the Stars, Robert Herjavec means business. This “Shark,” business leader, entrepreneur, author and race car driver shakes it up with professional dancing partner Kym Johnson. Anyone who’s watched Robert on Shark Tank or on the dance floor knows he’s there to win, eyes fixed on the prize—in this case, the coveted mirror ball trophy. Robert’s story is one of determination and ingenuity, after escaping Communism in the former Yugoslavia and landing on North American shores. Ever the self-starter, he delivered newspapers, waited tables, and then launched a computer company from his basement. Since those inauspicious beginnings, he’s built and sold several IT companies to corporations including AT&T. He launched the The Herjavec Group, a global IT security firm, and is its CEO. His two best-selling books, Driven and The Will to Win, say it all about a man with motivation and more. Speaking of motivation, you can book Robert to speak at your next business event, especially helpful if you need a push to keep pace with technological change. And who doesn’t? He’s driven and he drives. For the past three years, Robert has competed as Ferrari #007 for The Herjavec Group Racing in the North American Ferrari Challenge Series, with victories at The Montreal Grand Prix, Laguna Seca, and a Rookie of the Year title. Look for him in Sonoma April 25 – 26, and in Montreal June 6 – 7. Follow him on Twitter @robertherjavec, and follow him across the floor on DWTS Monday nights on ABC. Robert, you’re a business leader, entrepreneur, author, celebrity, race car driver and now—dancer! You look great! How’s this DWTS experience going for you? Kim said, “That’s a problem,” but she knew I was really athletic and in great shape before the show began. That’s the magic and ability of the show—that dancers teach non-dancers and it works. I lost five pounds the first week and I can appreciate that dancers are such incredible athletes. You dance, Robert, but do you play? So, the weight is falling off, but how do you Mind Your Body with what you eat? Right now, I keep forgetting to eat and I can eat anything right now. Friends keep sending me emails, asking “Did you eat today?” I eat lots of fruits and vegetables, and am blessed that everything I like to binge on is good for me. I was going to the gym before the show, but no need for that now. I’m really into this. Kym asks, “Are you sure you want to rehearse longer?” Yes! I’m loving it! I’m fully committed to this. You run—marathons. I run, but not that far! Tell us about what this does to and for your body, Robert. Any marathons on tap soon? I normally run every day, a minimum of five miles, and once a week eight to 10 miles, varying speeds. This has been a part of my life for many years. I love being outside, running a new city and just exploring. What one health habit would you like to do lose? Or do you even have a bad habit? How do you balance “everything”? That means your company, Shark Tank, DWTS, family, and fun—yes, fun! I have a great team of people that help me and are very honest with me, including my assistant and staff. You need people around you that are going to tell you the truth and look after you. How do you stay focused, because there is no question you know how? I learned years ago about the ability to stay in the moment. Yes, and in dance I’m learning to stay centered before I start the next movement and complete it. When I started dancing, I wanted to get ahead. Like in the cha-cha we did the first week—I’d already be cheating toward the next movement. It’s the same in life, so don’t get ahead. What’s the allure of car racing for you, besides going really fast? I love cars. This is about how far do I push myself to do something and stay in control. People misunderstand racing, thinking it’s so hyper, and that there’s such an adrenalin rush. There’s actually a calmness and inner peace about racing that you have to have since things happen so quickly. Even little mistakes can become really large. You’re friends with a lot of celebrities and powerful people. Has anyone in particular taught you a lesson? I’m a sponge for knowledge and always have so many questions. I’ve been very fortunate to meet exceptional people in life. And I remember one lesson I learned while standing in a corner at a party, probably a little arrogant and full of myself, having one of those days. The mayor came up to me and asked me if I was having a good time, and I replied that I had nothing in common with the group. That comments changed me profoundly. I find the same joy and interest in somebody who’s homeless as in someone famous. We can learn lessons from all people. We’re all given this journey to take, and it’s up to us to choose what we get from it. How do you look after your mental/emotional health, and do you ever get “down”? If so, how do you snap back? I exercise. It makes me stay focused. I spend time with people who are in need and it makes me feel better about life when I try to give back. What’s next on your life’s to-do list, Robert? No doubt, you will to-do it well. Can’t wait to see that, Robert, and for now, we’re cheering you on to a DWTS victory.